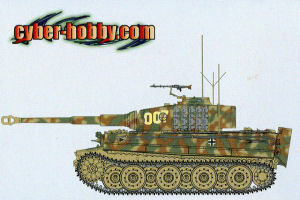 This time around DML affiliate cyber-hobby.com has taken their excellent Late Production Tiger I with Zimmerit Kit (No. 6393) and added some sprues and new marking to match the last known version of the tank used by SS tank ace Michael Wittmann. Forty-one parts have been added to or modified from their earlier kit (No. 6406) of the late model (e.g. “Steel Wheel”) version of the tank with zimmerit, but it retains a number of detail options, DS plastic single runs, and other details. As previously noted, the DS plastic looks good, takes paint well, and glues with common plastic solvents; it also permits undercutting such as the pin ends of the track and even open teeth to replicate castings as is the case here. Overall, cleanup is simple and I do believe most people will like these better. The two “sag guides” from previous kits are included so you can get a good fit over the wheels with the tracks. There are a great number of options with the kit: two styles of idlers, two different rear plates, three different mantelets, two different turret roofs, but as this tank is designed to match a specific variant with much more known information most of them will have to go to the spares box. It comes with only one commander’s cupola and other specific parts. As before a partial interior is included for the engine compartment as well as all of the torsion bars and the 8.8 cm gun breech in the turret. While the mount for the AA MG is provided, this time an MG34 is provided to fit on it. Many of the “brag book” features from the previous release remain with this kit. They have redone the mufflers and armored covers for the rear plate, fixed some problems with the turret escape hatch, redone the hull shell to make more use of “Slide Molding” features, and provided for the use of a engine pre-heater (read blowtorch) at the rear of the hull. However, if you wish to use that you will have to either knock one together from scratch or use the one in the VW Starter kit that DML just released. Zimmerit molding is confined to the lower glacis (D1), upper glacis (F5, now redone), vertical plate (D5), hull sides (D6 and D7), stern plate (D3), turret shell (D8), and the mantlet (D2). Three patch panels (D9, D10, and one DML forgot to flag on the D sprue!) are used to provide smooth surfaces for markings on the vertical plate but have to be cut out and inserted from the rear. It requires close attention to see where they are installed per the directions. Overall this is a very popular subject and with the the addition of factory applied zimmerit and DS tracks will make it easy to get a realistic model from the kit. However, based on the results of the sales of the first cyber-hobby.com Wittmann Tiger this will rapidly become a premium subject on eBay at a minimum of double the price, so anyone wanting one is advised to make haste to locate a kit.